Unluckily, using serial ports in Linux is not the easiest thing in the world. When dealing with the termios.h header, there are many finicky settings buried within multiple bytes worth of bitfields. This page is an attempt to help explain these settings and show you how to configure a serial port in Linux correctly. In typical UNIX style, serial ports are represented by files within the operating system. These files usually pop-up in /dev/, and begin with the name tty*. /dev/ttyACM0 - ACM stands for the ACM modem on the USB bus. Arduino UNOs (and similar) will appear using this name. /dev/ttyPS0 - Xilinx Zynq FPGAs running a Yocto-based Linux build will use this name for the default serial port that Getty connects to. /dev/ttyS0 - Standard COM ports will have this name. These are less common these days with newer desktops and laptops not having actual COM ports. /dev/ttyUSB0 - Most USB-to-serial cables will show up using a file named like this. /dev/pts/0 - A psuedo terminal. These can be generated with socat. A listing of the /dev/ directory in Linux with a connected Arduino. The Arduino serial port is present as /dev/ttyACMO0. To write to a serial port, you write to the file. To read from a serial port, you read from the file. Of course, this allows you to send/receive data, but how do you set the serial port parameters such as baud rate, parity, e.t.c? This is set by a special tty configuration struct. This code is also applicable to C++. One of the common errors you might see here is errno = 2, and strerror(errno) returns No such file or directory. Make sure you have the right path to the device and that the device exists! You must log out and back in before these group changes come into effect. At this point we could technically read and write to the serial port, but it will likely not work, because the default configuration settings are not designed for serial port use. So now we will set the configuration correctly. When modifying any configuration value, it is best practice to only modify the bit you are interested in, and leave all other bits of the field untouched. This is why you will see below the use of &= or |=, and never & or | when setting bits. We need access to the termios struct in order to configure the serial port. We will create a new termios struct, and then write the existing configuration of the serial port to it using tcgetattr(), before modifying the parameters as needed and saving the settings with tcsetattr(). We can now change tty’s settings as needed, as shown in the following sections. The c_cflags member of the termios struct contains control parameter fields. If this bit is set, generation and detection of the parity bit is enabled. Most serial communications do not use a parity bit, so if you are unsure, clear this bit. If this bit is set, two stop bits are used. If this is cleared, only one stop bit is used. Most serial communications only use one stop bit. The CS<number> fields set how many data bits are transmitted per byte across the serial port. The most common setting here is 8 (CS8). Definitely use this if you are unsure, I have never used a serial port before which didn’t use 8 (but they do exist). If the CRTSCTS field is set, hardware RTS/CTS flow control is enabled. The most common setting here is to disable it. Enabling this when it should be disabled can result in your serial port receiving no data, as the sender will buffer it indefinitely, waiting for you to be “ready”. Setting CLOCAL disables modem-specific signal lines such as carrier detect. Is also prevents the controlling process from getting sent a SIGHUP signal when a modem disconnect is detected, which is usually a good thing here. Setting CLOCAL allows us to read data (we definitely want that!). UNIX systems provide two basic modes of input, canonical and non-canonical mode. In canonical mode, input is processed when a new line character is received. The receiving application receives that data line-by-line. This is usually undesirable when dealing with a serial port, and so we normally want to disable canonical mode. Also, in canonical mode, some characters such as backspace are treated specially, and are used to edit the current line of text (erase). Again, we don’t want this feature if processing raw serial data, as it will cause particular bytes to go missing! If this bit is set, sent characters will be echoed back. Because we disabled canonical mode, I don’t think these bits actually do anything, but it doesn’t harm to disable them just in case! The c_iflag member of the termios struct contains low-level settings for input processing. The c_iflag member is an int. Clearing all of the following bits disables any special handling of the bytes as they are received by the serial port, before they are passed to the application. We just want the raw data thanks! Both OXTABS and ONOEOT are not defined in Linux. Linux however does have the XTABS field which seems to be related. 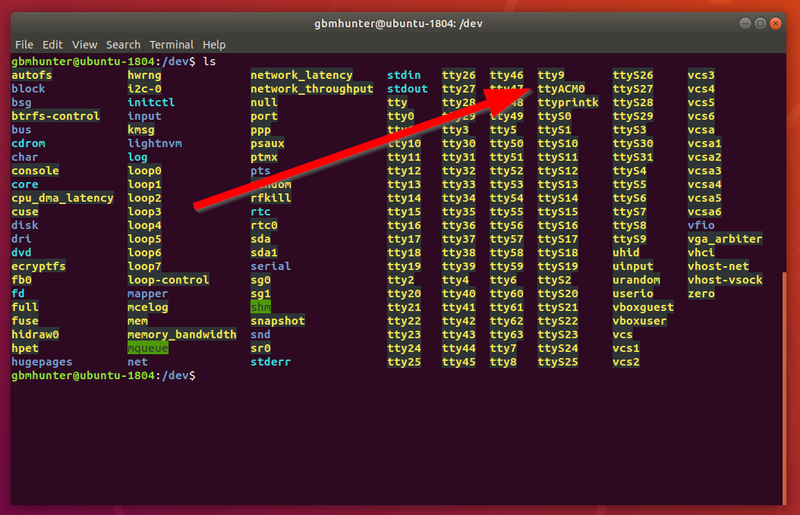 When compiling for Linux, I just exclude these two fields and the serial port still works fine. VMIN and VTIME are a source of confusion for many programmers when trying to configure a serial port in Linux. An important point to note is that VTIME means slightly different things depending on what VMIN is. When VMIN is 0, VTIME specifies a time-out from the start of the read() call. But when VMIN is > 0, VTIME specifies the time-out from the start of the first received character. VMIN > 0, VTIME = 0: This will make read() always wait for bytes (exactly how many is determined by VMIN), so read() could block indefinitely. VMIN = 0, VTIME > 0: This is a blocking read of any number chars with a maximum timeout (given by VTIME). read() will block until either any amount of data is available, or the timeout occurs. This happens to be my favourite mode (and the one I use the most). VMIN > 0, VTIME > 0: Block until either VMIN characters have been received, or VTIME after first character has elapsed. Note that the timeout for VTIME does not begin until the first character is received. VMIN and VTIME are both defined as the type cc_t, which I have always seen be an alias for unsigned char (1 byte). This puts an upper limit on the number of VMIN characters to be 255 and the maximum timeout of 25.5 seconds (255 deciseconds). “Returning as soon as any data is received” does not mean you will only get 1 byte at a time. Depending on the OS latency, serial port speed, hardware buffers and many other things you have no direct control over, you may receive any number of bytes. tty.c_cc[VTIME] = 10;    // Wait for up to 1s (10 deciseconds), returning as soon as any data is received. Not all hardware will support all baud rates, so it is best to stick with one of the standard BXXX rates above if you have the option to do so. If you have no idea what the baud rate is and you are trying to communicate with a 3rd party system, try B9600, then B57600 and then B115200 as they are the most common rates. For Linux serial port code examples see https://github.com/gbmhunter/CppLinuxSerial. Now that we have opened and configured the serial port, we can read and write to it! Writing to the Linux serial port is done through the write() function. We use the serial_port file descriptor which was returned from the call to open() above. Reading is done through the read() function. You have to provide a buffer for Linux to write the data into. // n is the number of bytes read. n may be 0 if no bytes were received, and can also be negative to signal an error. // n is the number of bytes read. n may be 0 if no bytes were received, and can also be -1 to signal an error. Getty can cause issues with serial communication if it is trying to manage the same tty device that you are attempting to perform serial communications with. Getty can be hard to stop, as by default, if you try and kill the process, and new process will start up immediately. These instructions apply to older versions of Linux, and/or embedded Linux. Load /etc/inittab in your favourite text editor. Comment out any lines involving getty and your tty device. Run the command ~$ init q to reload the /etc/inittab file. Kill any running getty processes attached to your tty device. They should now stay dead! It can be prudent to try and prevent other processes from reading/writing to the serial port at the same time you are. See http://www.gnu.org/software/libc/manual/html_node/Terminal-Modes.html for the official specifications of the termios struct configuration parameters.